The CONTI SYNCHROTWIN® double-sided timing belt is a drive element that allows opposing motion drives even in high output classes. 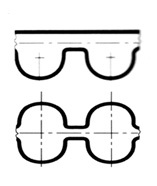 CONTI SYNCHROTWIN® double-sided timing belts are suitable for same-direction and opposing rotary movements. They hence enable compact space- and weight-saving drives with an efficiency of up to 98%. • CXA for high torques are characterized by their constant length and the teeth's high resistance to deformation.The heavy-duty versions with aramid-fibre-reinforced elastomer enables the sense of rotation to be reversed even for high rpm rates and torques. • The standard version allows economic solutions in the lower and middle performance range and is also available in the DHTD trapezoidal profile. 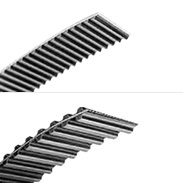 You can search by the belt profile and belt length, then you will be provided with all possible options. Mark belt profile and enter belt length, or only belt profile.